Canada stood apart Monday from some major allies, the U.S. included, in refusing to condemn Israeli plans for new settlements in areas claimed by the Palestinians. On Friday, Israel announced plans to build 3,000 settler homes in the West Bank and east Jerusalem to punish the Palestinians for winning greater recognition at the United Nations General Assembly the previous day. The United States, which joined with Canada, Israel and six other countries in opposing the Palestinian move at the UN, broke ranks Monday to directly criticize Israel. The White House and State Department said the Israeli announcement would hinder the resumption of peace talks. In addition, five European countries called in Israeli ambassadors on Monday to protest the new settlement plan. Germany, meanwhile, said Monday it took a "very negative view" of the settlement announcement. Previously, the UN has warned the move could be an "almost fatal blow" to the peace process. 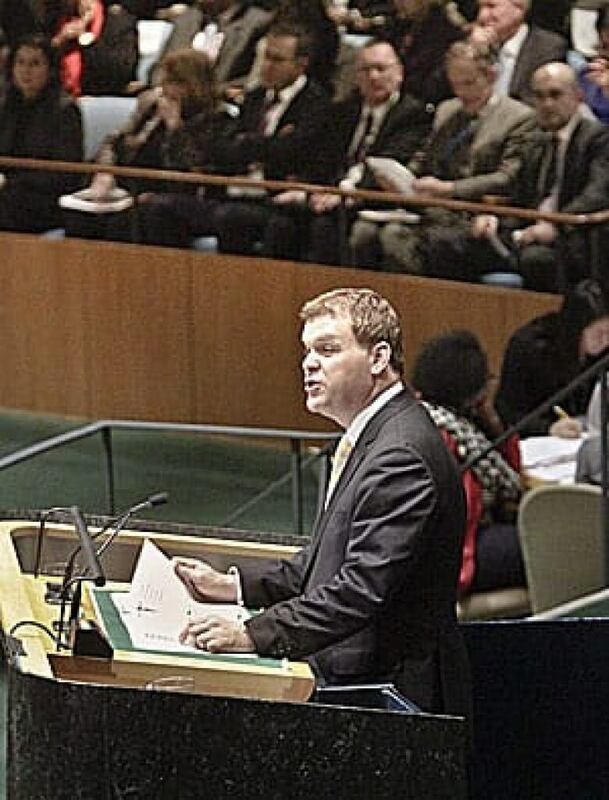 The spokesman for Foreign Affairs Minister John Baird stuck Monday to the same response line: "Unilateral actions on either side do not advance the peace process." Baird's office refused to say whether the government stands by the established government policy that says Israeli settlements are a "serious obstacle" to peace. 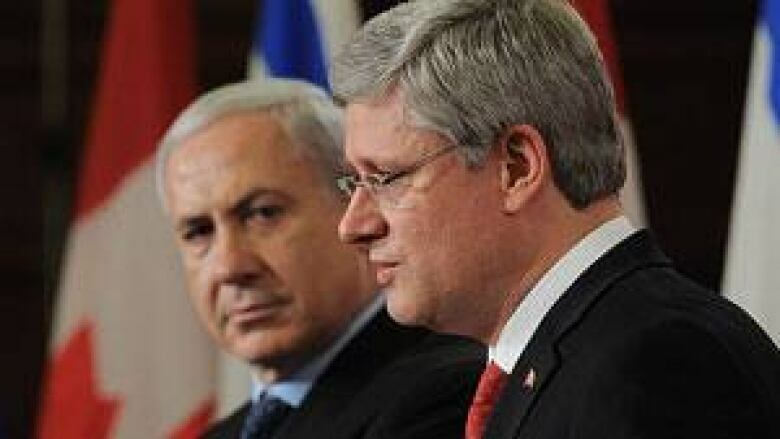 Stephen Harper's spokesman refused to say whether the prime minister raised the question of the new settlement construction when he spoke Saturday by telephone with Israeli Prime Minister Benjamin Netanyahu. "No further comment on the call — the PM's tweet will stand," Andrew MacDougall said in an emailed response to questions. "I can state that Canada's position is that unilateral actions on either side do not advance the peace process." Harper's Twitter account said Saturday: "Spoke today to Benjamin Netanyahu, who thanked Canada for its friendship and principled position this week at the UN." Canada's allies were more vocal about the new Israeli settlement plans, including on the contentious patch of land known as E1, outside Jerusalem. "We urge Israeli leaders to reconsider these unilateral decisions and exercise restraint as these actions are counterproductive and make it harder to resume direct negotiations to achieve a two-state solution," said White House spokesman Jay Carney. U.S. State Department spokesman Mark Toner said the E1 "area is particularly sensitive and construction there would be especially damaging to efforts to achieve a two-state solution." Building on E1 would effectively prevent any future Palestinian state from having a contiguous border, undermining hope of creating a viable state. Carney also reiterated the White House's "long standing opposition to Israeli settlement activity and east Jerusalem construction." The Conservative government in Ottawa appeared to be intent on distancing itself from that similarly-held view. "As referred to in UN Security Council Resolutions 446 and 465, Israeli settlements in the occupied territories are a violation of the Fourth Geneva Convention. The settlements also constitute a serious obstacle to achieving a comprehensive, just and lasting peace," states the Foreign Affairs Department website. "Canada believes that both Israel and the Palestinian Authority must fully respect international human rights and humanitarian law which is key to ensuring the protection of civilians, and can contribute to the creation of a climate conducive to achieving a just, lasting and comprehensive peace settlement." The Canadian Press asked Baird's spokesman in an email whether the government still held that view. The response was: "Unilateral actions on either side do not advance the peace process." The spokesman declined a request to elaborate. The head of Amnesty International Canada called on the government to speak more forcefully against the new settlement plan, as other countries are now doing. "It's unfortunate to simply characterize this as being a unilateral action. These are human rights violations. These are breaches of international humanitarian law. This isn't simply deciding to do something unilaterally," said Alex Neve. Given that Israel is making a deliberately timed settlement announcement, Neve said: "I think the response from Canada should be equally clear and not left to implicit interpretation as to what Canada is or is not saying, or is or is not concerned about." Netanyahu's office was unbowed Monday by the pressure it was facing from abroad. "Israel will continue to stand up for its essential interests even in the face of international pressure, and there will be no change in the decision taken," said a statement from his office. "The Palestinians' unilateral step at the UN is a blatant and fundamental violation of the agreements vouched on by the international community. It should come as no surprise that Israel did not sit idly by following the Palestinians' unilateral steps." Chris Hall: What should be Canada's role in the Middle East?